Oh, my dear writing friends. It was another of those breathtaking moments that reminded me once again that, yes, I really do have a book coming out in nine months. That, after a long journey that sometimes felt so hopeless (and pointless), someone loved my story enough to buy it. In short, I discovered two days ago that my book has been listed on Amazon (and every other online bookseller). Of course I clicked right over--and read, for the first time, the jacket copy. No cover art yet, of course, but that's just one more thing to look forward to. (I saw some early concept art recently; that was another pinch-myself moment.) I'm sure I'm not the only debut author who has read her brand-new-shiny Amazon listing over and over. (Or maybe I am. In which case, please don't tell me.) All I know is--I don't need a single present under my Christmas tree. See for yourself: STORMRISE ON AMAZON.COM. Naturally, I announced this on my personal Facebook page as soon as it happened. I expected my friends to rejoice with me; I didn't expect them to start preordering the book. Those orders were the icing on the cake. I'm so grateful--and so humbled. If you've clicked over, you've also read the blurb I received from Tamora Pierce. I don't think I can adequately express how thrilled and blown away I am by her words of praise for Stormrise. And also for the gumption of my wonderful editor for sending the manuscript to Tamora in the first place. So, yes, I'm celebrating with great thankfulness today. And there's this: If you're on your own journey toward publication, let my joy be your reminder that you have no idea what your future will hold. It took me twelve years to finally land a book deal. 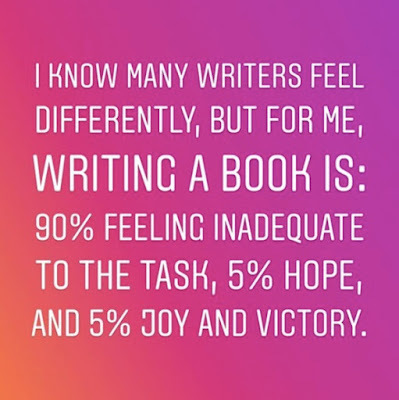 I wouldn't wish that amount of time on anyone, but I do want to remind you that YOU HAVE TO KEEP WRITING AND PRESSING THROUGH THE HARD TIMES. Trust me -- it works. Thank you for sharing my writerly happiness. Here's to believing that your own isn't far away. Secret Agent Coming in January! 1. Up to 50 entries of the first 250 words of a completed manuscript will be accepted. The Secret Agent will read and critique all entries, and will then choose a winner (or winners). 2. This contest is open for unagented authors of unpublished (but completed and agent-ready) works. 3. January's genres will include: women's fiction, mystery, suspense, historical fiction, and young adult (all genres). 4. Submissions for our January contest will be on Monday, January 21. 5. 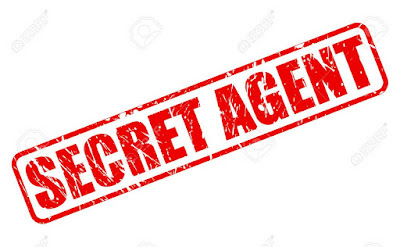 To learn more about Secret Agent Contests, GO HERE. Please don't hesitate to ask your questions below! By now, most of you have probably read somewhere on social media about my dramatic faceplant into a banister, resulting in 8 stitches to my lower lip and 3 loose teeth, one of them cracked. Okay, it was more than cracked. It was shoved into my hard palette, and the ER doctor had to push it back into place. Seriously messed-up teeth going on over here. My lip is healing and, after a week and a half, I can actually smile again. But chewing food isn't anywhere in my near future, so right now everything is a smoothie. All I can say is THANK GOODNESS I CAN STILL WRITE! Other than occasional bouts of grumpy-hunger (because liquid diet) and tooth woe (but I'm finally off the Ibuprofen, so yay! ), I've been able to move forward with both my copyedits (done!) and my WIP (almost done!). 1. The official new title of my novel is STORMRISE! 2. The official release date is September 10, 2019. My dad's 86th birthday! 3. THERE WILL BE ARCs FOR GIVING AWAY. Stay tuned! Also, I'm happy to announce that WE WILL BE HAVING A SECRET AGENT CONTEST IN JANUARY! I know it's been a while! I'm nailing down the details with the agent and I will post submission guidelines as soon as I have them. I've been so absent. But then, I knew this was coming--there is a vastly different feel to writing TOWARD the hope of publication and writing AFTER you've signed a contract--and your editor has set a date. It's odd, really; I'm doing the same thing I've been doing for thirteen years, but the underlying pressure of knowing it's already sold and I-have-to-get-this-right is a reality I'm learning to embrace. Victoria (V.E.) Schwab recently posted the above quote on Instagram. I read it and it stabbed me deep in my belly, because THIS IS EXACTLY HOW I FEEL. The encouraging part is that the feeling of inadequacy isn't paralyzing me. I simply keep pressing ahead, writing my 1000 words a day, learning to multitask story restructuring with continued drafting (definitely a new place for me). And I'm learning that pressing through the underlying belief that I don't know what I'm doing and every word on the page is dung is making me stronger and more capable. Mind you, there are always the unbidden bouts of angst that grab me by the entrails and shake my world for a time. That's when the tears come--those moments where I truly and utterly believe that I CAN'T DO WHAT I'M ACTUALLY DOING. Think about that. I'm DOING it, but I don't believe I CAN do it. Even though I've DONE it before. Are you feeling it? Nodding vehemently, maybe? Fighting your own tears? What we create is always bigger than we are, because that's what art is, in all its forms. BIGGER than us, to draw us out and encourage our minds and hearts and spirits to expand. It's also bigger than us because it really does take a village to create a book. 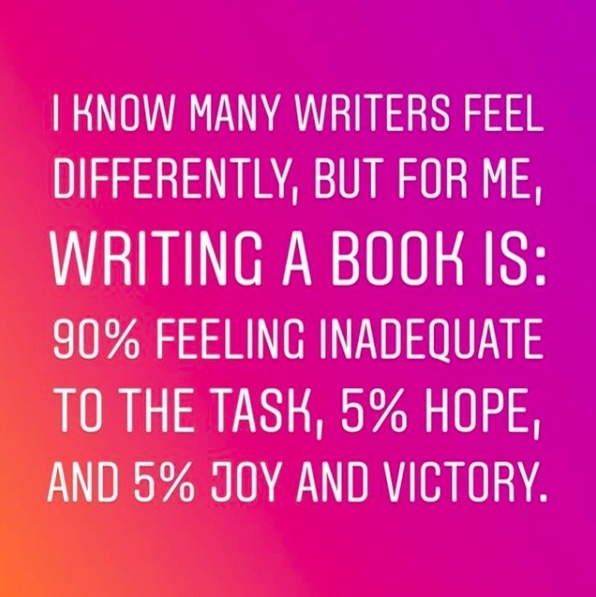 We all know that writing doesn't take place in a vacuum, and that the input from our beta readers and critique partners and agents and editors is a huge part of each story's development and final state. Yet the feelings of inadequacy persist. So I fight through them every day, enjoying moments of sparkle and moments of hope along the way (though it's not unusual to have many days in a row without any hope at all). Sometimes I actually say out loud to myself, "Why am I doing this?" or even "I can't do this." Seriously. That's called SPEAKING LIES TO YOURSELF. And I know better. Anyway. As soon as I read Victoria's words this morning, I knew I had to share them. My brain screamed THIS THIS THIS THIS until I saved the file and opened Blogger. Because always, always, always, there is someone who desperately needs not to feel alone. Someone who feels so inadequate in the moment that quitting feels easier. Don't do it. Don't quit. And now, if you'll excuse me, I'm heading back to Scrivener and my hot mess of a story (that, deep-down inside, I'm excited about, despite the first draft slog and the constant I-can't-do-this), and I'm going to SLAY the sense of inadequacy today. It's probably no surprise that I have some offspring who write. Many of you already know that my oldest daughter Maggie recently signed with Danielle Burby (we share an agent!). But it's my youngest's work I want to showcase today. Once upon a time, there lived a charming princess whose name was Autumn. She lived in the most beautiful castle with splendid rooms and a lovely garden. Autumn was learning all the proper things a princess should know, like dancing and curtseying and many more graceful things. Autumn did not enjoy it, though, for secretly she wanted to fight with soldiers and lead battles--very surprising behavior for a princess. One day she had a talk with her best friend--and brother, too--Forest. Forest was two years older than Autumn (who was sixteen). They both had raven black hair, and while Autumn had brown eyes, Forest had forest green eyes. Autumn pleaded with her brother to teach her to fight and defend herself, and reluctantly, after many tears from Autumn, he agreed. So every night they crept to the training chamber and practiced. A year later, Autumn was doing her princess things when the alarm bell sounded. The castle was under attack! Her mother tried to usher her into the safe hiding spot, but Autumn pulled away and started running to her room. She pressed a hidden panel in the wall where she had been keeping her training armor and hurried to put it on. The soldiers tried to stop her as she went running past them to the front doors, but she would not stop. With a battle cry, she launched herself at the leader of a giant army--the greatest and most feared leader of the seven seas. She stopped suddenly as she realized who she was facing, then charged. The soldiers, encouraged by her bravery, yelled and fought. What seemed like hours later the war was over. Autumn's kingdom had survived. What I mostly want to point out is that I have never sat down and taught Molly how to write a strong female character. She knows the premise of my upcoming novel, but I haven't allowed her to read it yet (she's not quite 11, so I'm making her wait; mom's prerogative). I'm sure my storyline of girl-dresses-as-boy-and-runs-away-to-the-army inspired Molly's story in some way (and she did steal one of my character names!). I'd also like to think, though, that she unconsciously drew from her own life. She has two brothers, so in addition to growing up with dress-up and Barbies and ballet, she has also climbed trees, played "war" with her (mostly male) neighborhood friends, and learned to shoot an arrow with the miniature bow her hunter brother gave her one Christmas. My favorite part of Molly's story? This: The soldiers, encouraged by her bravery, yelled and fought. Not only is our heroine strong and brave, but she ENCOURAGES OTHERS TO RISE TO THE MOMENT. A true leader! In her little-girl way, Molly has touched on the beauty of a strong leading lady who isn't harsh or angry or trying to be something she isn't--she just knows what she wants, works hard, and then leads others to victory, going against everyone else's expectations of her. I'm a proud mama. And yes, I did ask Molly's permission to post this today. She says she is honored. Good thing, because I'm honored to be her mom. Thanks for indulging me. 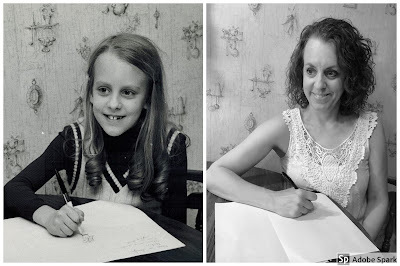 Here's to raising up the next generation of writers, one pink-inked, scribbly story at a time! Here you go -- 15 dialogue-rich excerpts for your sharp eyes! Is the dialogue natural-sounding (do people really talk this way)? Is there distinction between character voices? Does the dialogue move the scene forward? Officer? My stomach tightened and I slid off the barstool. “Are you Mrs. Roberts?” a male voice said. My eyes widened. Didn’t I know that voice? I definitely knew that voice. What was he doing here? What? But the raincoat. I was so careful. I felt the top of my head. It was hot. Of course. I was sweating during that intense drive. The sweat from my head must’ve gotten to the hood. What a fool I was. I pressed my hand against my throbbing chest. What do I do? He can’t see me. I tried to flatten my messy hair. But he literally can’t see me. I bolted up the back staircase just before Mom reached the kitchen. I crept along the upstairs hallway and struggled to slow my breathing. I was about to press my sweaty palms against the wall behind me but stopped myself. It wouldn’t help matters if I made part of the house disappear. I stood when she walked into my office. Regardless of how I felt about Eleanor Steele, she was a lady. I’m too much the Southern gentleman to disregard my upbringing. “What can I do for you, Mrs. Steele?” I managed to ask without snarling at her. Ducking her head, and fending off the sun with a hand, she didn’t see the youngest member of the crew, Caleb, as he walked past her carrying a load of finished lumber. She tripped, and then raised her head just in time to hit the underside of a board. “Ahhh,” she said crossly. “It’s okay.” Miss. Not Missy. She liked the way that sounded. “Real, okay?” asked Mogul as he directed deck traffic. “Then both say, sorreee.” said Mogul. She blinked in surprise. His eyes were so dark she always they thought they were brown. But they weren’t. They were as deep blue as the ocean’s depths. “S-s-s-sorreee,” she stammered back. “All good. Now, done.” Mogul clapped his hands. The 12 year old school-leavers are waiting to take part in the Trials, hoping to be accepted to train as one of the privileged Flame-Dancers. Among the trialists are members of the subclass Toilers. Extract: Imogen squeezed Josie’s arm. “Remember … Zip it,” she warned. “Don’t worry. I won’t utter a single word,” said Josie. “You just have,” pointed out Emmalina. “Shuddup, don’t look, they’ll see you,” hissed Josie. But the tall, pale-faced Toiler wearing a yellow sash had spotted them. He flushed scarlet and covered the armband with his hand. Josie turned away quickly. She’d have like to look a bit longer, to see if the girl from the Burning was there but then the boy would think she was staring, like Emmalina. “I bet that Brother by the door knows,” said Emmalina. “Emmalina! You can’t just ask,” said Deeba. “Yes,” said Emmalina, setting off towards the door. Jesse was abused by her now-dead brother & is having violent nightmares about him, endangering her pregnancy. Old Katie, using the Celtic power of insight, tries to relieve her fears. The spell grew deeper as the old woman caressed the girl's temple. A memory encroached upon the empty spaces the poppies had left behind, making its way into Katie's consciousness as their spirits joined together. The old voice soothed her, the gentle fingers continued their circular journey. The girl moaned softly and, turning to the old woman, wrapped an arm around her waist, held on to her as a baby would. “Mama.” The stress was gone from her voice. “Yes, my dear. I am here.” Katie resumed her caress, circling the girl's temple with light fingers. Time passed, and still her hand did not stop, did not tire. The girl twitched. “Has Evelyn harmed you?” Katie did not believe this could be so. Dee, a homeschooling mother, slays the occasional vampire that comes her way. She and her friend Hope follow a map that may lead to the source of the vampires. Hope came to a dead stop. “This makes no sense. The path we’ve been following from this map keeps going straight. But you can see where the trail we’re walking on goes.” She gestured to the left, where the trail curved. “The answer is in front of your face.” Dee pointed with her flashlight. Natalia continued kicking stones, feeling the warmth of the sun on her back. Miguel joined her kicking small stones. They both love playing soccer at school. “You are quiet today,” Miguel said. “Maybe you can write about La Llorona,” Miguel suggested. Natalia loved meeting ghosts, except one. She didn’t want to meet La Llorona. No way. That would bring nightmares and make Natalia crawl under bed. “I think that they do,” Natalia replied. “When I talk to them, they talk back. Last time when my grandmother came, I put a paper and a pen on the table and asked her to write what she said. She tried and tried to pick up the pen, but could not. “Ghosts are like clouds,” he said. A politically precocious 11-year-old presents her case before her new principal hoping it will make her popular with her classmates. “It's a petition from two-thirds of the sixth grade for tacos,” Isabella said. “Okay,” Mr. Gardner said, stretching out the word like a lazy cat. “Requesting what exactly?" She paused for effect like the old YouTube videos she’d studied of Senator Ted Kennedy on the Senate floor. “And that would be our tacos." “Yes. I visited with the Food Services Manager. She said since school began on a Tuesday this year, the Food Service department still considers it the first day of the school week. A culinary Monday, so to speak. So..."
Jade has been tasked with keeping an eye on Ash, the new student in the College. They cross paths on the stairwell. Ash smiled. “I’m sure I’ll find a way.” He started down the stairs. “You can’t make your own rules,” I called after him. Then I set my teeth and followed him. Cousins, K.J. and Becka, barely know each other thanks to a long-time disupte between their mothers. They're on a road trip, doing their late Grandpa's unfulfilled bucket list. “So, uh . . . were you and your brother close?” K.J. asks. I freeze, goosebumps arising on my arms. It’s like she knew I’d been thinking about him. “Not especially,” I say because it’s the truth. “Oh. . .” Obviously my answer wasn’t what she was expecting. “But if you mean, do I miss him, the answer is yes. I do. He annoyed the crap out of me sometimes, but I loved him.” More than I ever let on. “Yeah, well if I’d known my brother was gonna die, I would have made an effort to get to know him better. But that’s the problem, you don’t know these things.” My stomach clenches with this admission, and I swallow back the lump trying to form in my throat. I should have been a better sister. K.J. nods thoughtfully. “True.” Another beat of silence. “So do you ever talk to your dad?” she asks. I tolerate my father, but I still think he’s a gigantic jerk for what he did to my mom. It’s funny because Mom seems to blame her sister more than him for the affair. My dad and I just never bring the topic up. It would be way too awkward with him. Nick and Elena are sitting at the table in a moving RV, and have just discovered the driver implicated them in armed robbery at their last stop. The driver is Nick's cousin, Elena suspects they're part of the mob. “They’ve got your face and that’s all they need to find your name,” Nick said gently. “But—but,” I stammered, unable to mount a good argument. Using my arms as a cushion, I laid my head on the table and tried to reason my way out of this. I was dead broke, there was no way the cops would believe I wasn’t in on a robbery scheme. Telling them I’d been abducted might help if Nick backed me up, but would he? What was my other option? Would ‘lying low’ even work? Hotshot arson expert Draymond “Dino” Bernadino helps an old friend (Chief Sinclair) investigate a baffling series of devastating fires plaguing her city. They have just met with the Mayor. Liz and her brother Kyle have been pulled into her imaginary world. In this scene they're talking to a mysterious stranger who is explaining how they got there. I sat back, my mind reeling. Other worlds? For the second time in the last couple of days everything I knew came crashing down. First, my imaginary world had risen into existence around me, cutting me off from everything familiar, and melding my brain with a character I had made up. Now, apparently, that was somehow normal. UN Sec-Gen asked a favor from his assistant to have a try and befriend his teenager son to catch up with his mind after reading a suspicious status hailing ISIS on his social media. The assisstant got carried away by associating the boy to Turkish Cyprus after his imposing will. Gothic style mosque! Give me a break! “What! Really! Was that its previous identity?” Niandhra exclaimed as she got the answer to her conundrum. Silence fell as Niandhra struggled with the truth about Adrian’s claimed feelings. “You know, Muslims are not that bad” she tested him. Adrian turned to examine her intently. She felt his cruel judgmental eyes all over her reassessing from a scratch every bond they have shortly developed. “Who?!" Niandhra choked, "Mustafa Pasha this ex-Nicholas Cathedral is now named after?!" “My husband is a Shiite” She snapped without much thinking before incoherently adding, "They call it civilisational pairing sometimes!" A time travel cop meets a beautiful thief on the Titanic, but his mission fails. To his surprise, he meets up with the woman on his next mission at a tavern. “Coffee is better in the future?” Julia asked. “Hey, I needed to eat, and there are a lot of people around here with money. Then I met a doctor who told me about needing help at the hospital and I volunteered. Now I stay there." Ready for some in-house critique? Let's have another round of Talking Heads, where we focus on dialogue. Let's face it--dialogue can be tricky. It needs to sound natural while still moving the plot forward or revealing important things about our characters. The best check for natural-sounding dialogue, in my opinion, is reading it out loud (I highly recommend this!). But another check is to let other eyeballs read the ramblings of our characters. Submissions will be open from 9:00 AM to 9:00 PM on Thursday, August 16 (tomorrow!). This will be a lottery; the bot will choose 20 entries at random after the submission window has closed. Entries will post on Monday, August 20 for public critique. PLEASE NOTE: The lead-in is important because it will help us to understand what's going on in your scene. If you want the most helpful feedback possible, please don't neglect to include this! I've been having a tough time plotting these past couple of weeks, and it brings to mind how helpful it is to sometimes simply have someone sit down with us and ask all the "what ifs". Even if the particular question doesn't quite fit our story, it's amazing how this sometimes jars our imagination to the point where we have our A-HAH! moment and can continue on. Are you plotting/story planning/drafting? Are you feeling stuck/confused/discouraged? Ask your question in the comment box below! I will copy it here (in the body of this post) so people can see it easily, and then they'll be able to comment beneath your comment to perhaps offer the question you most needed. My protagonist and her boyfriend have arrived at her house late at night, and this is a turning point where something awful has happened and it looks like her boyfriend is responsible, but I can't think of what that awful thing should be. My hero needs to go to the Plains of Despair, because there is a magical item there that is important for his quest. However, I can't come up with a believable motivation for him to go there, other than I just need him to. Can you throw me some motivation questions? Now, those may seem sort of vague, but trust me (and I'm sure you already know this)--you never know what will spark you. It's like a bottle of Drano poured down a hair-clogged pipe! THIS IS IMPORTANT: As folks leave their ideas, don't come back and tell them why their ideas won't work--unless it is posed as a question! For instance, if someone says, "What if she finds the bloody razor after the donkey relay? Would that throw off your time line?" In this instance, it's fine to answer yes or no, and engage in dialogue. But please don't be a Negative Nellie and punch down other people's brainstorms. Read, absorb, let your brain start quietly ticking. Post your stuck-place in the comments below. Then share the link to this post and wait for help to arrive! There's so much emotion involved in the unfolding of a debut novel. The work--the nitty-gritty, teeth-grinding, hand-wringing work--is largely behind me, and now there's this huge, invisible machine that cranks behind the scenes. Crank, crank, blurbs from authors. Crank, crank, fabulous cover artist. Crank, crank, release date moved. On it goes, and whenever I really think about any part of it, my stomach shoots down to my toes and the sheer THIS-IS-ACTUALLY-HAPPENING overwhelms me all over again. This is the picture-with-a-moral, of course, which is, as always, KEEP WRITING. The first picture was taken in March, 1974, by a photographer from The Morning Call (the newspaper for the Allentown area of Pennsylvania). They did a lovely article on my writing, including an interview and several of my poems and drawings on a full-page spread. It was, for a not-quite-nine-year-old, a heady experience. And, of course, the picture on the right was taken just a few weeks ago. I mean, THE WALLPAPER. It's the same! So are the table and chair. I couldn't not take advantage of such a perfect time capsule. Mind you, I didn't quite fit in the same little nook I'd squooshed myself into when I was 8. But I'm still pretty pleased with the results, thanks to the patience of my dear husband. 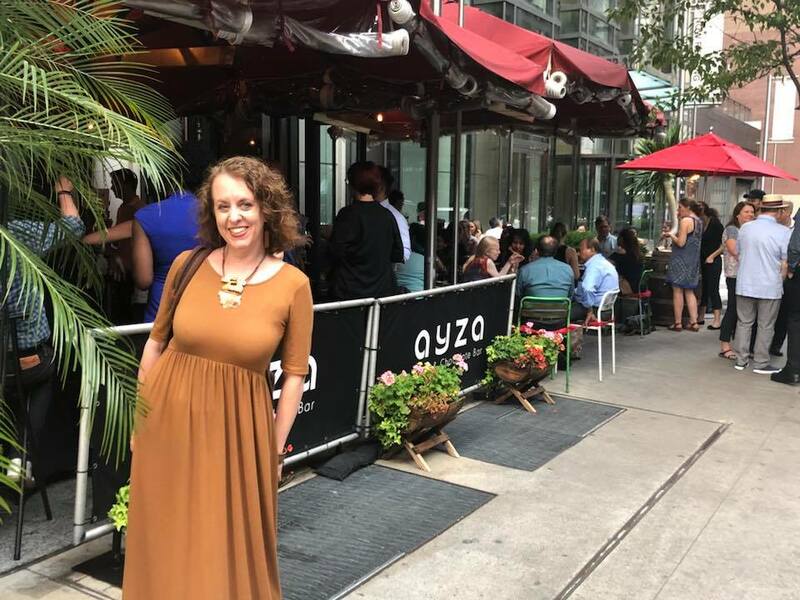 Other than spending Father's Day with my almost-85-year-old dad, who is and always will be my original Prince Charming, another highlight of that first week was a trip to New York, where I spent time with both my editor and my agent! I met Elayne in the foyer of the Flatiron building, where the Tor offices are located, and we walked up the street to have lunch. This was our first face-to-face, and I absolutely enjoyed every moment! One can only hope--and not be guaranteed--that there will be a "click" between author and editor, and I was not disappointed. Elayne exuded a loveliness and down-to-earthness that made talking with her sheer pleasure. (The fact that she's in love with Mr. Thornton is an added bonus.) I wish I'd asked our waiter to take a picture, but he was a bit off-putting and the opportunity didn't present itself. At any rate, I was thankful for the gift of meeting Elayne in person, and I remain oh, so thankful to have her as my editor. After way too much walking (husband Eric was born in Yonkers and isn't the least bit intimidated by the city--and he clearly didn't anticipate my level of wimpdom), I met Danielle at an amazing wine and chocolate bar for dinner. Ever since Gathering Storm sold last September, Danielle and I have been talking about sharing chocolate martinis to celebrate. She picked the absolutely best place to do so, and it was seriously the best chocolate martini I've ever had. No, really. I'm wrecked for life. And they were served with this amazing dark chocolate, filled with a ganache that made me question the necessity for any other food, ever. I could've sat there until the moon rose and the city streets emptied. Truly, words fail me for how much I love and appreciate this woman. She has stuck by me through hard revisions, difficult plotting, and repeated disappointment. She's empathetic, insightful, brilliant, and funny, and, why, yes, I am gushing. On an incredibly exciting, not-so-side note, Danielle recently signed my daughter, Maggie Boehme, who has written an incredible YA survival story that's going to knock the socks off any editor who reads it. I'm as over the moon about this as Maggie is! I've watched Maggie grow from her sweet, fumbling attempts when she was 11 or 12 (yes, she jumped right in and started writing novels! ), through her teen years when she got really serious about her writing but didn't have the maturity to go back and revise, past the college years when writing had to take a back seat to course reading and term papers, to recently when she jumped back in and blew me away with how far she'd come. She has a natural knack for creating multi-faceted, believable characters--the kind that stick with you for days after you finish reading the book. The kind that make you cry. I'm so proud of her. But you knew that. Anyway. Our second week of vacation was spent at the shore. 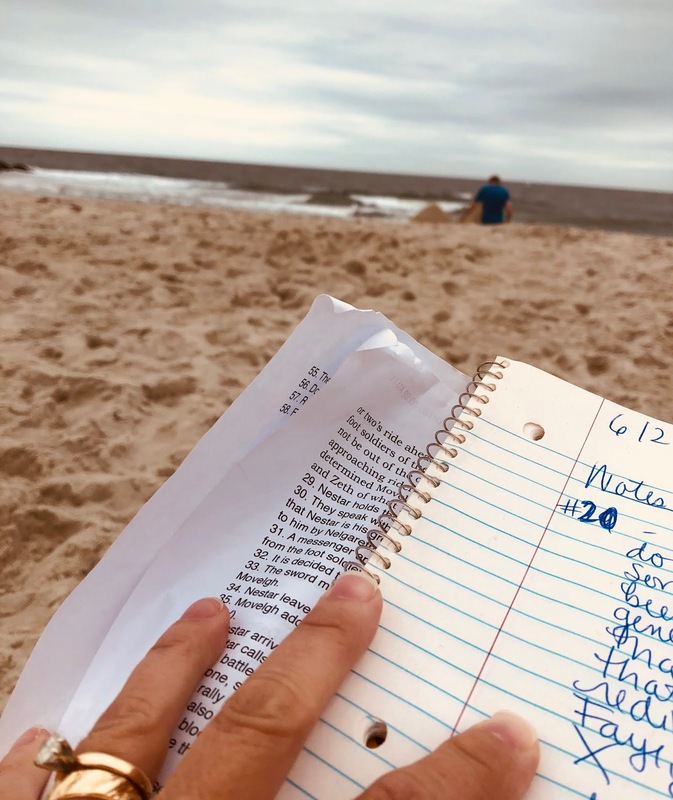 Yes, I wrote almost every day, but writing near the ocean is something I wish I could always do, so it didn't exactly feel like work. Not exactly. And now we're home, and July, my wonderfully, beautifully open month of almost no commitments, is flying by at an alarming rate. And there you have it! So much to be thankful for. The latest news is an amended release date for Gathering Storm, so take note: September, 2019. For some strange reason, that doesn't feel so far away! The only stinky part is that, since my book has been shifted from a summer to a fall release, I'll have to wait until November to let you all know what the new title is. I think that's about it! Oh, and if you haven't yet subscribed to my newsletter, take a minute to sign up now. The next issue will be out on August 9. Happy weekend! Happy writing! And thanks, as always, for sharing my journey. Congratulations to the following 3 authors, who have each won a 5-page critique from me! Winners: Please email me at authoress.edits@gmail.com for submission instructions. A huge thanks to everyone who entered--and keep those critiques coming! I won't be leaving critique, but I WILL be choosing my 3 favorites, each of which will receive a 5-page critique (privately). Look for that announcement tomorrow! Raid has no idea he’s falling for the girl of his nightmares when Azrielle, a human-cockatrice hybrid with a lethal gaze, infiltrates his elite squad of teenage monster hunters. Her objective is to stop the rising body count—not flirt with the enemy. If her identity is exposed, she’s dead. Fastest way to a guy’s heart is a bullet between the third and fourth rib. Knife works too, but it’s slower, messier, and requires close range. I don’t need either. I’ve got something better. Static crackles over the comm in my ear as I tail a group of humans creeping through the French Quarter ruins. If they see me, they’re dead. Dressed in black gear, the Venators think they blend with the dark as if night vision goggles aren’t a thing, glowing green in the middle of the road through my NVGs. They should know better than to hunt us in our territory. No way they’re reclaiming this city. It belongs to Legends, ‘monsters’ like me. More than eighty miles from the nearest functioning civilization, light pollution can’t touch us out in the Dead Zone. Clouds cloak the sky, hiding the moon and stars, threatening luke-cold January rain. Won’t be enough to drop the temperature. Sweat collects at the nape of my neck, humidity weighing down the air in my lungs. I miss snow and ice. These humans are all that stand between me and freedom. Seven bodies left. I already eliminated the other two units. Kills still fresh in my system, phantoms of their dying heartbeats echo in my chest. Finish this one last mission and my service debt—or rather my father’s—will be fulfilled. Do this and I’m done. No more Shade and their self-righteous crusade of noble intentions that lead straight to the graveyard. Sixth grade was supposed to give Felicity bravery. It gives her a mess. The new president of the Northern States wants to deport the ‘Southies’, immigrants from the Southern States. Then Felicity gets in the middle of it. She makes friends with a wisecracking Southie named Madrid. Staying friends requires bravery—or foolhardiness, with the imminent deportation. But she can’t just walk away. HOW TO SAVE A FRIEND is middle-grade contemporary fiction with a twist. It is 40,000 words. Some people say it began when the election did—when every person in the country heard and saw who was going for the top. Others say it started when the final candidates were picked, and the promises started to happen. For me, it started when I came to breakfast one morning, following the smell of scrambled eggs. My parents were smiling, and I knew what had happened. I knew before I looked at the newspaper dangling from Dad’s grip. I knew before I read the blaring headline. COREY BARDATOKEN WINS IN LANDSLIDE! In presidential election, the country chooses The Honest Way. It was my first real election, since I was seven during the last one. I was eleven then, my twelfth birthday drawing nearer as fifth grade drew to a close. But though I watched the men debate on television, I had no clue what was really going on. I barely knew who the candidates were, much less their campaigns. My parents had voted for him. They thought he was the best option, and fooled themselves into thinking that meant good. At my school, if the election came up at all, everyone would just say what their parents had said. Almost all the kids said their parents were voting for the Bard. The Bard was his nickname. What if you made a promise to someone but 170 years later, you broke it? A small blackboard sign outside O’Neill’s Irish Pub, on the opposite side of the road, caught my eye. It read: Trouble sleeping? “No, thank you,” we replied in unison. Cautiously we made our way down a set of narrow wooden stairs and noticed the door at the bottom. The lighting was poor, and the bulb emanated a reddish glow that reminded me of an Indian restaurant we used to frequent regularly on Lexington Avenue that had since shut down. God, how I missed that butter chicken dish. I put my hand to my nose; the stench of urine was overpowering. Mom made a sick face and pointed to a sign saying ‘toilets.’ Ugh. Softly, Mom pushed down the handle of the door and stepped inside the room, I followed her and spied a massive man with his back to us. Empty cans from a party the night before littered the floor and the room stank of stale beer. His black hair was shaved to the scalp and his head was shaped like a full moon. He rocked gently back and forth in a trance-like motion as he talked to someone behind a pillar; hidden from view. I could hear her soft sobs and I watched as he comforted her. I felt awkward. We stood there for a few minutes until Mom decided the stench was too awful to bear and stomped over to a chair not far from where the others sat. The man instantly swung around to face us. When 16-year-old Kira’s best friend dies, Kira - convinced she is still alive - goes to the castle where she disappeared to rescue her. But to save her friend, Kira must kill an undead spirit, a choice that will destroy the magic protecting their city and Kira’s one chance to erase a memory she is desperate to forget. “Come on, G. No one is going to die tonight.” Jerril Menkaure made another swipe for the ring of cast-iron keys, her electric blue nail polish leaving a trail of iridescent sparks in the dim sitting room. Her goyle’s ears flattened against his head, and he hopped backwards, barring the way to the locked door her brother had strictly ordered her to stay away from. In his hard, dark eyes, the reflection of candle flames flickered. Talons clutched the key ring tighter to the goyle’s chest. A string of harsh, staccato chirps burst from his mouth. A fierce hiss startled her to silence. G’s eyes bulged, and with a snap, his leathery wings spread to their full span. With an explosive pop, G shifted into a foot-high woman with long black hair, bloodshot eyes, and fangs curling over her lips. Spooky just wants to lay low and get through a program for delinquents. But boot camp exceeds her worst expectations when an ancient god emerges from the wilderness and kidnaps her for entertainment. She strikes a deal for her freedom that either kill her or deliver everything she’s ever wanted. Something brushed Spooky’s elbow. Luke slipped a piece of paper into the palm of her hand. A note. A passed note, like the ones she’d shuttered back and forth between two friends in her freshman year English class. It was old school, but she couldn’t help but smile. The camp confiscated personal devices and restricted the use of pens, so this was the first message she’d received all summer. Luke would have had to think ahead about giving her this. She wanted to read his face as much as the words he had put on paper, but she kept her eyes trained on the front of the cafeteria. The fence wasn’t really designed to keep things out. Spooky had seen the exposed bars and chain-link before her parents brought her through the gates. The plastic sheeting that made it impossible to climb only ran along the inside. For most of her life, seventeen-year-old Espie Hernandez’s life has revolved around El Padre and the cult-like compound he rules. She prides herself on being loyal, and truly believes, as El Padre preaches, that those outside the compound, The Others, want to destroy them. But then she sees things that make her question El Padre. Soon she finds herself in the unthinkable situation of being banished from the compound forever unless she can bring proof of the weapons The Others are stockpiling to use against them. When she finds The Others she also finds that nothing is quite how it had been portrayed. Who is it that wants to use the weapons? The Others, or El Padre? Espie has to decide who to trust, her leader, or Phoenix, the Other boy who offers her kindness. Time is running out. As everything she’s been taught is torn apart, she still needs to find the strength to look inside for what really matters. Why did I come again? The old building creeped me out, but I had no idea that what was about to happen there would change my life, my whole world, forever. Weather-beaten, the wood sagged as if resigned to its fate. Shadows flirted through cracks in the boarded up windows. The house slumped in defeat. I shivered, pulling my hoodie closer but warmth eluded me. The desert nights were brutal even within El Compuesto, the compound where we were confined. My sister Xochil had snuck out earlier, which only increased the anxiety growing inside me. No longer did it feel right to sneak out after curfew. Doubts resurfaced. Doubts I didn’t want to address. I only wanted to save my sister from doing something stupid. Why did the leaders insist we had to share a vidcom? Merilyn Bookwright would prefer to hang the witch hunters plaguing Salem, but witches rarely get what they want in colonial New England. Yet the sheriffs searching for witches have forgotten the oldest wives' tale. Be careful what you wish for because you might just get it. Merilyn Bookwright has never wanted to kill anyone, much less in front of her daughter, but the shout, "Be careful! There's a witch on the loose!" reminds her that neither God nor fate has ever shown much concern for her wishes. Taking them into her own hands, Merilyn pulls Gwenifer close, while the Puritans skitter away from the sheriffs, each person staring at their neighbors with expressions that all ask: "Who?" For those few seconds, everyone is a suspect. Anyone could be next on the judges' list. To lessen the chance she's put on it, Merilyn shrieks, "Please save us from the witch, Sheriff Corwin!" and faints alongside Gwenifer, who mimics her mother without instruction. It's what every witch learns before they can be trusted with magic. Although her daughter's heart beats hard enough for Merilyn to feel through her hug, Gwenifer wiggles forward to spy from beneath her bonnet as well. The ever-smiling Sheriff Corwin and his team of witch hunters sweep past, checking the other women in the marketplace. The plain wool dress so many wear hides the wolf among the sheep until the accused reveals herself by running toward the docks. "Don't let her reach a boat!" Sheriff Corwin says, charging after his prey, but even the largest sailors scatter before her, no more willing to fight a witch than a mouse would a serpent. ABOUT TIME + THE GOOD PLACE. With her guardian angel’s help, 16-year-old Gemma changes the past and saves her murdered boyfriend—but doesn’t anticipate bringing his killer back too. Now, she must thwart the murderer and reclaim her lost love before her old memories fade, along with her happy ending. Exiting the BART station, I book it three blocks to the deli, late for work again. A breeze too cold for August blows in my face, making me hunch into my jacket, and low-hanging clouds, floating overhead like clumps of dirty cotton balls, do nothing to lighten my mood. A memory hits me. Ben and me and a bag of cinnamon rolls. “Still warm, Gemma.” Buttery and sweet, we cut first period to eat them in the park. A cop car drives by and we duck behind the picnic table, fingers entwined, choking back the laughter. It’s so vivid, I’m back there, feeling Ben’s cinnamon-scented breath on my cheek, tasting the sugar on his lips. Remembering feels like a stab to the gut now, raw and fresh, because Ben is gone. When Quinn Garner was ten years old, he traveled to another world and stole an evil king’s magic. Seven years later, Quinn is forced to return to face the king when he rises again. Only, Quinn has no memory of this other world or the strange magic he once controlled. The King of Nightmares stared out at a crumbling world from the highest point of a castle in the sky, awaiting news from his spies that even then were scouring the world for signs of the thief. Savior they called him. Hero. As if he was anything more than a common thief, as if he’d done anything short of stealing their world, tossing them aside as if they were nothing. The thief had come like any other, in the dark of the night. His legend spread fast and the world bent to his whims. The magic that the king had spread through the world – millions of dark threads that let him see and feel and hear everything, keeping the world and its people under his control – had slipped away. Not one by one. Not slowly, over time, as the king worked to keep them. But overnight. All at once. One day, he was ruler, king, god. The next… he was nothing. The king’s fists tightened as he turned to pace. He would be nothing no longer. He was still weak, still without power, but he was so much more than a simple thief. He knew better now. Years had passed and he was stronger, smarter. He understood his enemy. He knew what he had to do. It’d all be so simple, in the end. It was time for the king to rise again, and the thief — the hero — would lose this time. After his mother’s death, 12-year-old Prince Agmund thinks life can't get any worse. He's wrong. When a sorcerer makes a blood-magic pact with a dead tyrant, Agmund endures racial slurs, his human father’s rejection, and his kingdom’s hatred. And if he helps others like him fight an enemy they can’t see? He could lose his life. King Ulrich closed his eyes and pinched the bridge of his nose. A low crackle in the fireplace broke the silence, but the king never moved. He sat that way for a long time before opening his eyes again. “Father, didn’t you hear me?” Agmund’s voice was a muffled squeak. The king kept talking, but so much heat flooded Agmund’s body, he thought his head would explode. He bit his lip. That healer might do something for her, but he'd have to figure out why she was sick in the first place. Her people drew power from nature itself. They lived for centuries unless they died in battle or were grieving. She hadn’t been sad, had she? Agmund wiped his slick palms on his tunic, hoping it stained the fabric. Emery Glass is a Mirror Maker. She can create a mirror and walk through the reflection into an alternate reality. To return, she simply breaks the mirror, and the reflection world ceases to exist. When Emery’s sister disappears in the Mirror World, Emery will do anything to find her: break the rules, design illegal mirrors, even face being exiled from the Ward. My little brother, Gates, lied about me dying. Of course, it’s best everyone thinks I’m dead, and he’s smart enough to know that. Every week, they air my story on WatchBank. Sometimes it flashes twice a week on the com-screens distributed around The Shadows. Many of the sector’s worst criminals live there. I suppose they think I’m famous amongst the villains. In the nicer areas of the ward, such as Glass Hill, it’s broadcast at least once a month on the cyber kiosks. It looks out of place mixed in with the stories that spotlight first-class citizens. Or the celebrity webcasts. That’s probably why they keep it minimal in these areas. Now that I’m a fugitive, I have to work on a new disguise. I hope I can come out of hiding soon and live life again. Being the most hated girl in the world isn’t easy. Well, maybe not the world, but it might as well as been the entire universe. That’s how I feel. The sun glistens off the river. Early morning is my favorite time of day. Gates will be here with whatever food he’d scavenged from the table without notice. I somehow make every crumb count. ADDAMS FAMILY meets GHOSTBUSTERS when twelve-year-old Derek confronts headless ghosts at Hyde’s Funeral Home & Used Coffin Outlet run by his mortician parents, Jack and Formalda. The ghosts' young son wants revenge for losing his haunted home, while Derek desperately tries to keep out of the embalming room—as a client. But Derek Hyde wasn’t eaten and he definitely wasn’t spin dried, either. Just driven to the narcoleptic town of Littleburp in the family car (actually, an old yellow school bus), and then to a really unfortunate and grossly undesirable address: 1313 Slimeytoes Lane. It was bad enough his parents dragged Derek out of his seventh grade class and away from all his friends to limp across the country in a broken-down bus on this Journey to Nowhere. Much worse was the notion of moving him into a spooky old manor house they planned to convert into a funeral home. On this blustery autumn day, Derek watched through rain-streaked windows as they screeched to a halt in front of the scariest mansion he’d ever seen. After Tab’s crush crushes her, she dreams of a boy who’s desperate to find her, discovers he’s alive, and sets off to find him. SEEKING STANLEY DERRINGER is Jane The Virgin meets the Holy Grail quest, a YA romance set in a Berkeley alternative school and a Detroit garage. It was the end of a Sunday lunch shift at Tia’s Tacos. I watched two women linger over a shared enchilada. I tried not to stare at the one with her back to me, tattooed up to her sleeveless tee, who tenderly fed the last forkful to a woman holding a baby. What was wrong with me? I didn’t want a baby. What did they have that I didn’t have? Oh, yeah. Each other. Someone to love. A soul mate. In other words, everything. “May I?” I asked the couple as I reached for their empty plate. I laid the check in the middle of the table. The woman holding the baby tucked her into a fabric sling. “Harmony,” the baby woman said. She eyed my thumb as my hand passed in front of her face. I could always tell when somebody noticed. My thumbs were shaped like little square paddles because of brachydactyly, an inherited trait. Mom thought I got it from my bio dad but I’d never met him so I never really knew. Tia watched from the door to the kitchen. Her arms strained with the weight of a full bin of mole sauce. She groaned as she plonked it on the prep counter. “I can do that! Sit down!” I hurried to fill bins like I was supposed to between customers. Instead, I’d been reading Parzival, about a naive knight on a quest. Seventeen-year-old Zaina has no desire to leave her tribal home. Staying means she can spend more time with an afrit named Tasdemir, the elemental earth spirit who protects the valley where she lives. But then Tasdemir disappears, throwing the valley’s natural balance into chaos. If Zaina can recover the afrit, she may be able to save her tribe and the valley. The tree was full of goats. Zaina locked eyes with the closest, a male who was perched several feet above her head on a thorny branch, chewing his cud and glaring at her balefully. The goat considered her command, pausing in his methodical chewing. It was all the warning she received. Moments later, he spat haughtily in her direction. Zaina ducked, missing being pelted by a whistling kali seed by inches, but she was not quick enough to evade the rest of the cud. The slobbery, oozing mess landed on her shoulder, coating the ends of the scarf she had wrapped around her hair. Zaina wrinkled her nose as the glob slid lower, onto her sleeve. It was pungent, the odor made stronger by the heat of the sun overhead. Planting her feet in the dusty ground, Zaina threw her head back and met the goat’s eye again. A giggle at her elbow drew her attention away from her quarry, and she turned her hard glare on a new victim. When a cosmic event crashes the Earth’s power grid, a young scientist and humanoid cat must stop invaders from destroying their island to control the world’s energy. Violet woke with a snort. She sat up and looked at her hands. The same. She pulled up her sleeves. Her arms had the same orange freckles and dark brown skin. Maybe…she took a quick peek under her shirt. Not yet. Jumping out of the large clamshell bed, she ran into her dressing room. She threw off a dirty lab coat hung on the mirror and looked intently. She bared her teeth and stared with big, green eyes at her freckled face and unruly purple hair. Tying her hair on top of her head, she turned away. Nothing has changed! Disappointed, she grabbed the closest lab coat on the floor and slipped into sneakers. Putting her pants over the shoes proved cumbersome. When she stopped to take off the shoes first, she thought, There’s still the whole day! Maybe something will happen when her mother was there. She liked to observe everything “to experience the science.” Violet was used to being examined every minute of the day. Bounding down the DNA spiral stairs, she spotted her mother’s black-haired topknot in the lab and ran over to her. Summer Hamilton wants to start over, but her panic attacks and flashbacks from an accident haunt her. When Rafe Bryant strolls into her life, she knows the hot biker is trouble. But at every turn, he’s there, and the sparks between them are irresistible, until she remembers her forgotten love. Laughter filled the Italian bistro La Rosa’s in the North End of Boston along with the mouthwatering odors of garlic and tomatoes making Summer Hamilton’s stomach rumble. Sipping her iced water, she eyed the menu for the hundredth time. She knew exactly what she wanted because she was a creature of habit and loved chicken parmesan, but she held off giving her order waiting for her husband to arrive. Replacing her glass on the small white linen covered table, she twisted her wrist to study her Rolex—he was late, very late. Surveying the various tables, she passed the time playing a game imagining the stories behind each group or couple near her at the popular restaurant where glasses clinked in celebration. She idly picked out a shy couple on a romantic date looking nervous, a couple celebrating their first wedding anniversary eyes glued on each other oblivious to their surroundings, and large families celebrating a birthday—all making memories. Rolling her wedding band around her finger, she wondered if tonight would be a good memory, a year from now. Organizing this evening was her last attempt to salvage her marriage, and yet again, she sat alone uncertain as to whether he would even bother to arrive. Pulling her phone from her purse, she clicked to check if there were any messages—nothing. Outside the rain splattered on the steamy glass window and people charged down the sidewalk carrying umbrella’s trying to avoid getting soaked. Throttled with grief from her boyfriend’s death, Seventeen-year-old Sam is given an opportunity to see him in an eccentric city called VOLT but as she sets out, with two other teens grieving lost ones, the lies that hold her life together sabotage her efforts to find him. My fingers caress the nearest cloud to me. The wisps of cottony fluff are the gentlest texture imaginable. Beauty this resplendent is reserved for those who see the world in its true form - through shards of distorted glass, through shrieks of light and darkness, through chaos, and madness. This is my existence. My reality is wrapped in white, soft all over, and a cacophony of sounds assault me. Yet, it’s silent at the same time. A pink fleshed baby piglet wiggles its twisted tail to where I sit. My lips part in a strain to smile. Except the task is too great. My mouth collapses back to nothing as I sit perched on the billowy cloud. A consuming pain shatters the peace around me. It’s a razor slicing through delicate skin, drawing crimson droplets so bright it aches to look away. My cloud dissipates into a fine mist. I contemplate what’s before me. I stand, nearly nose-dive to the wood floor in my living room, but straighten before I collide. With my long legs, I pace from the black sofa to the bay window overlooking the front of our house. I peer out for the tenth time in the span of a few minutes. The lawn is bare and in need of watering. Dying from lack of nutrients and care. Weeds suffocate the delicate fuchsia flowers that once blossomed like proud exhibitions of beauty that once lay inside the house. I’m hopeful Ryan’s beaten-up car will come spluttering to a stop in our circular driveway. The Case of the Cat Crazy Lady, the first of a proposed series, is a completed 73,000-word cozy mystery featuring cat lover and animal shelter/Pet cemetery owner Cathy Carter. After Buttercup Bend's "Cat Crazy Lady," Maggie Broom, is smothered to death in her home, Cathy is stunned to learn that the animal shelter and pet cemetery she co-owns with her brother Doug is the recipient of the bulk of Maggie's sizable estate. Cathy and her reporter friend, Nancy Meyers, set out to solve the murder. Placing the flowers on the ground in front of the stone, she wiped her eyes with a tissue she took from the pocket of her blue cardigan. Growing up with cats and dogs and now being part owner of a pet cemetery, Cathy was familiar with the deep pain of losing a special animal friend. The handsome gray and white cat she’d had since the age of twelve left special pawprints on her heart. She would never forget Floppy. She turned as she heard a low rustle. Glancing behind, she saw it was Oliver, the elderly Siamese she adopted two years ago after his ninety-year old owner died. Oliver approached on his cocoa paws. He let out a loud meow. It echoed through the quiet cemetery. She patted his head as he rubbed against her calf. She felt his touch through the legs of her jeans. “What are you doing out here, Oliver?” She was sure she’d closed the door behind her of the small house she shared with her grandmother.